Today is Family Day. Family Day began in 2001 by the National Center for Adiction and Substance Abuse at Columbia University. Visit their site here. CASA Research "consistently finds that the more often children eat dinner with their families, the less likely they are to smoke, drink or use drugs. The conversations that go hand-in-hand with dinner will help you learn more about your children's lives and better understand the challenges they face." Family Day was created as a way to help reduce subtance abuse in children and is celebrated on the fourth Monday in september every year. On the web site, CASA says, "Family Day is not just for families. It is a day for all to celebrate, including businesses, unions, religious organizations and community groups. The symbolic act of regular family meals should be promoted and celebrated inside and outside the home throughout the year." Isn't it interesting that this research organization at Columbia University is telling us to do what we need to be doing as the Church every Sunday. 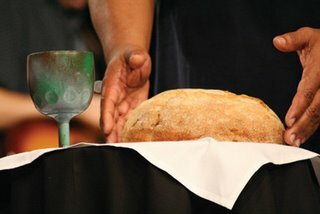 As citizens of the Kingdom of God, we have a meal that we eat together (although as Nazarenes we don't receive often enough), Holy Eucharist. Remarkably, it too is a meal that should be linked to the reduction of adiction, poverty, AIDS, violence, greed, and war. Perhaps if we received more often, the world would see the grace of God spill out of us more often into a world that so desparately needs it. I am of the opinion that the best possible response to worship and a sermon on Sunday, is by washing it down with Holy Eucharist. I am also of the opinion that the best response to Holy Eucharist is to go into the world and make suffering folks lives better. Good post, and I agree, the CotN doesn't eat it enough!